Early in my career as a management consultant, a colleague and I were working on a project for a large gold mining company. The mine had more improvement opportunities than they had funding for and so wanted to ensure that they spent their limited capital on the best possible combination of opportunities. They needed four months worth of modelling completed in two weeks to meet budget deadlines. So, we locked ourselves away in tiny, windowless room with a steady supply of coffee and ingenuity and two weeks later we had created two value calculators identifying 35 million tonnes in increased productivity. I’ve taken what I learnt from that project, and many like it, to identify 15 principles that allow you to successfully use value driver modelling and avoid many of the pitfalls that can derail a project. Often on a project you will have more requirements expected of you than time to deliver them. Prioritisation will help ensure that the most important features are completed within time and budget. It also allows you to understand the broader purpose of the model and not get distracted by minor problems or features. There are many ways to prioritise a model’s requirements. I’ve used the matrix below which is based on the factors of “importance” and “ease of implementation”. An alternative approach is the MoSCoW method. This is particularly useful if you have a client who has a clear understanding of what they want. To avoid confusion, VDT elements should only exchange inputs and outputs from with other elements of the same level or one level above. This ensures simplicity and reduces any unforeseen interactions between entities. To illustrate why this is important, picture a factory making widgets. The manufacturing process moves forward from delivery of raw resources, processing, manufacturing, packaging and delivery. The creation of value (in this case, the widgets) goes from one stage to another; widgets never go ‘back’ through the process. It’s rare to have a model perfectly and completely documented at the start of a project. Additionally, you may have a client who doesn’t really know what they want until they see and use it. To avoid spending time and money developing a completely polished product that the client does not want, instead produce a working prototype as soon as possible. This will quickly highlight the actual requirements for the model and allow you to focus your efforts for the rest of the project. Even if the entire prototype is discarded, so long as it contributes towards progressing the project, it was still worth producing. Overly complicated models are difficult to troubleshoot which creates the risk of inaccurate or unpredictable outputs. It also becomes difficult to expand if new features need to be added. It’s best to design the model into modules that can be developed and tested independently. It also allows you to reuse similar modules for other models that require similar features. A potential risk with models is that they become quickly out-dated because of changes over time. If the model’s context is likely to change, identify those sections most at risk, and spend additional time building in flexibility. Typically changes that you will need to anticipate include expanding the scope and number of inputs (e.g a new call centre is added), create in new inputs and outputs (the model is expanded to include ‘delivery activities’ for a factory) and new data is updated (e.g a new set of cost figures). Not all of a client’s operations can be understood to the level of detail required to model it. However, often complex issues can be resolved through making reasonable assumptions. For example, does the model need to output daily figures, or can results be aggregated by month. Has the client and/or the subject matter expert signed off on the assumptions? Are the assumptions clearly recorded along with their value and rationale? Do you understand how the assumptions impact the model’s output? ‘Use cases’ are an intuitive way of working out exactly what a model needs to do. Use cases like the example below explains the relationship between a user, their requirement and the resulting benefits from using your model. A model could be poorly designed such that its outputs were very sensitive to small changes to its inputs. For example, the diagram below for widgets calculates the Widget Conversion Rate by subtracting the Statistical Rate from the Historical Rate. However, a 1% change in the historical rate drives a dramatic increase in Hourly Widget Production. This is called ill-conditioning and there is no automatic way of detecting the problem nor is there an obvious solution. However, thorough testing should highlight the problem. Then using an assumption, for this example, changing widget conversion rate to a static value may solve the issue. The prevailing level of accuracy is limited by your least accurate result. This means that despite having value drivers with various decimals, the highest level of rounding is the most accurate. For example, the widget conversion rate inherits the level of rounding from the historical rate. In turn, the hourly widget production value driver, inherits the level of rounding from sheet productivity. There are different ways of modelling an organisation’s variability. Simple value driver models use a conventional approach by using averages. More sophisticated models can use statistical methods to simulate the changes in productivity that real organisation’s face. 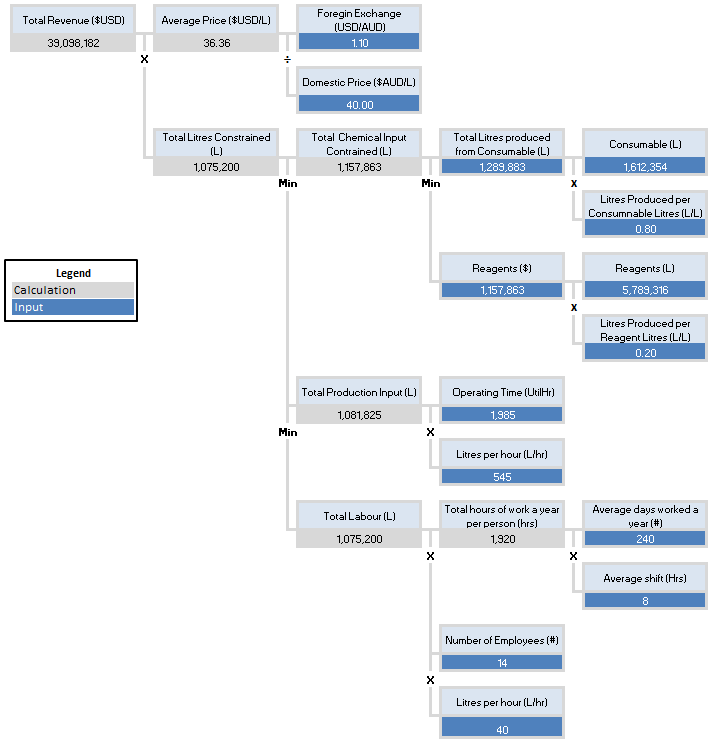 Additionally, these advanced models can simulate the dependencies between value drivers highlighting the inter-relationship between key parts of the organisation. Avoid inputs that become their own outputs. While this example below is overly obvious, in more complicated models it important to know how your inputs are being calculated and if those assumptions impact the accuracy of your results. This final section deals with a series of universal truths concerning the data you use in your models. You can never get all of the data you need. A complete set of the data you require for project will not exist. And the data you do received will most likely have been collected for purpose extraneous to your own. However, you can use the principles we’ve already discussed like use cases, assumptions and prioritisation to overcome this issue. Despite not being able to get all the data you need, you may be overloaded by the data you do have. Picking the information you use is very important, as it will form your model’s point of view. Information from different sources at best will be slightly different, at worse will be contradictory. Ensure that you understand the limitations and assumptions behind your data to ensure that it matches the reasons for you to use it. Lastly, when dealing with massive data sets, you can improve the performance of your model by only loading the data that you need. However, ensure that the model is flexible enough to broaden the scope of the data in case requirements change. You always have to develop some of your own data. Not all the data required to build the model will exist in a system already. You will need to work with the client, key stakeholders, subject matter experts. You may even need to go out into the field to ensure that information that is critical to the model is collected accurately and completely. You always have to synthesise data to meet the needs of the model. To bridge the gap between the data you cannot collect or does not already exists, you will need to make assumptions or synthesise some data. This is to allow the model to operate despite the fact that some of its components are currently unknowable. Ensure that these assumptions are well documented and understood by you and the key stakeholders. The next post in the value driver modelling training series will show you how to create your own value calculator and use it to decide how to best to improve your organisation. 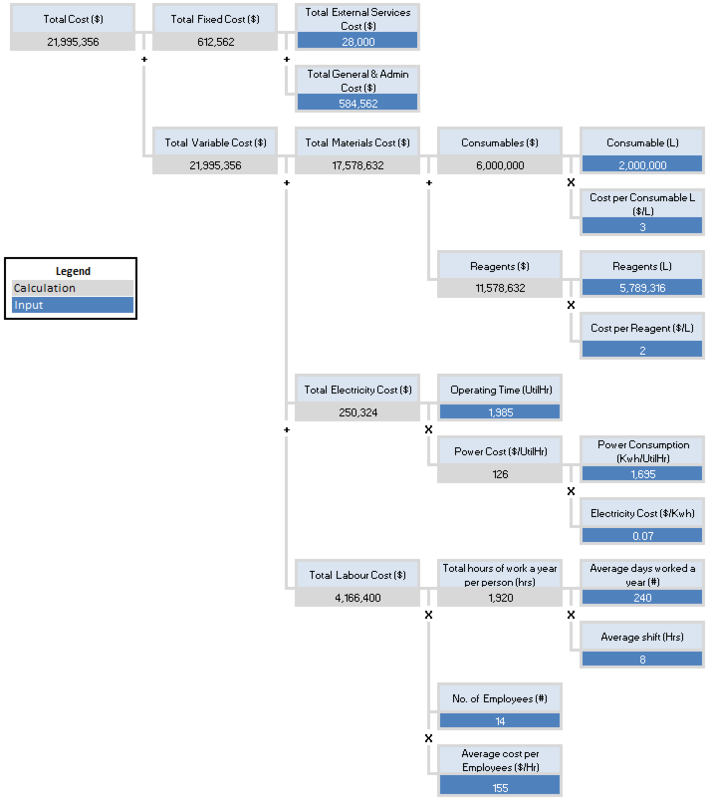 Value Driver Modelling – Part 1: What are value driver trees? At the peak of the mining boon in Australia it was vogue to use value driver trees to analyse your mining operations and to answer questions like “should I buy more trucks or am I better off with more excavators?”. These days there’s less consulting dollars floating around for value driver modelling but that hasn’t stopped it from being a fantastic way to visualise and analyse the flow of value from one part of your organisation to another, regardless of your industry. 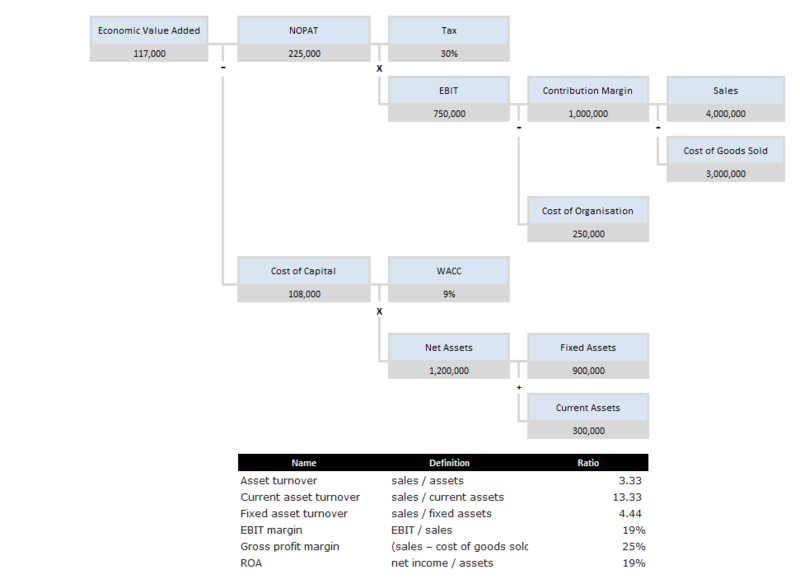 This is the first post in a series introducing the concept of value drive modelling and providing some practical examples in how to use it. What ways can VDM be used? identify where the biggest constraints are in an organisation’s ability to create value. be used in conjunction with sensitivity analysis to show which areas are at greatest risk for failing to deliver value. value a range of different investment options to find the optimal combination for creating value. provide transparency at the individual employee level to see how they contribute to the creation of value. allow you to benchmark operations that were previously too different to compare through traditional benchmarking methodologies. Before we get to the diagrams, let’s start with what we mean by ‘value’. Value can be understood as “something of importance, worth, or the usefulness of something”. Value can also be described as profit or stakeholder wealth. So, if organisations create value, when and where does this value come from? To visualise this value creation process we can use Porter’s value chain. A value chain diagram shows a chain of activities for an organisation operating in a specific industry. The chain of activities gives products or services more value than the sum of the independent activities’ values. The important distinction here is between primary and support activities. The primary activities are where all the value is directly created. The support activities, while critical for sustaining the business, do not add value directly to the product that the customer ultimately buys. While there are some legitimate criticisms of Porter’s value chain (least of all the failure of his consultancy) it still provides a straight forward framework for understanding how organisation’s might create value. 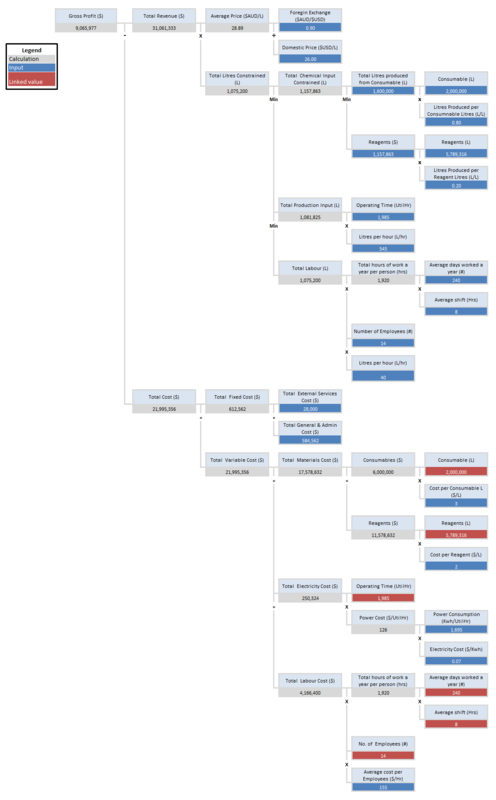 What are value driver trees? Value Drive Trees (VDTs) are the main type of diagram used as part of VDM. VDTs are basically a picture of the ‘gears’ or ‘value drivers’ that power a business. Here we have an example of the basic building block of a VDT. This building block forms part of a much larger VDT, which in this case is for the productivity of a dozer. The individual elements of this building block are simple. It has a heading, units, and a value. The definition of value in this context, is the amount of hectares cleared per annum. Now if I expand the tree, we see more elements to the VDT. We see that the boxes are connected in a relationship, and that that relationship is described mathematically, in this case, with multiplication signs. It’s apparent that these lower levels elements multiply together to equate to our starting element. This is the fundamental function of a VDT, to transparently show the relationship between different elements of value. It’s possible for this tree to keep breaking down into ever more detailed steps. What’s important to remember is that we are interested in those elements that are directly contributing value to the final outcome of the VDT. What are the different types of VDTs? The rest of this post will go through the different ways VDTs can be used and visualised. To interact with the VDTs, please download the Excel workbook here. Benefits Realisation VDTs can be built from Benefits Dependency Networks. A Benefits Dependency Network diagram (as above) shows the inter-relationships between enablers, business changes, benefits and investment objectives. At it most fundamental level, the purpose of a benefit dependency network diagram is to ensure that you don’t double count benefits from interrelated improvements or investments you make to an organisation. A Benefits Realisation VDT can quantify the benefit as well as show the relationship between the business benefits, operational assumptions and the investment objectives. The matching colours between the above diagrams show where these common elements are. Revenue VDTs show the flow of value through the primary activities of an organisation. This model constrains the flow of value based on key inputs. These constraints can show us where improvements could contribute additional value to the organisation. This is an overly simplistic VDT but shows you the basics of what a revenue VDT can do. Similar to a Revenue VDT, a cost VDT can use the same inputs to determine what the cost will be to an organisation. This VDT splits costs between fixed and variable. 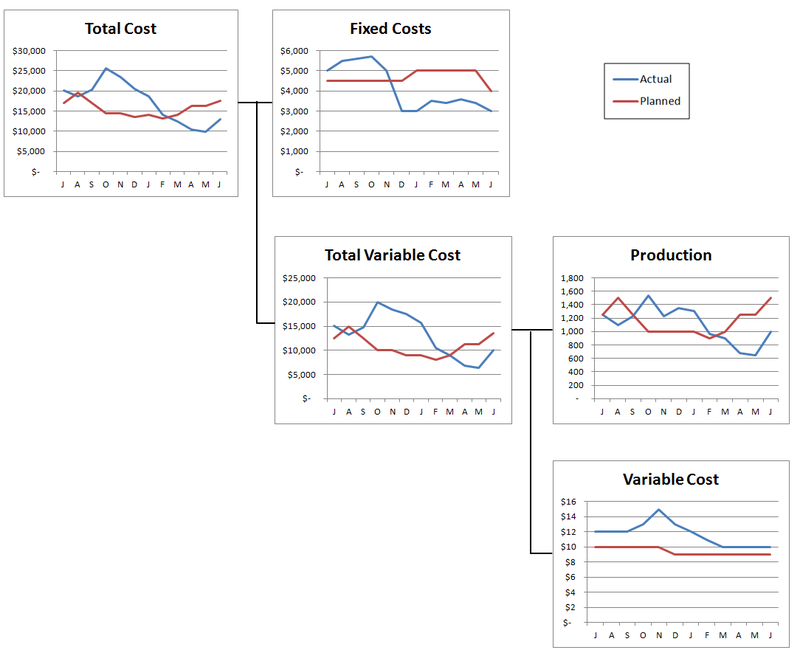 The variable costs are driven by the same input assumptions as the revenue model. A profit VDT is a simple combination of the Revenue and Cost VDTs. This allows us to change a single input and see how this reflects on the overall value to the organisation. This shows the play off between improving productivity and the impact this also has on cost. As an experiment, download the workbook and increase the number of employees working in the organisation from 14 to 15 (at cell O37). You might have assumed that having an additional employee might allow the organisation to create more value (in this case, gross profit). However, as you can see, the additional employee also increases the total cost of labour and without a corresponding increase in productivity for the manufacturing plant itself (see Total Production Input (L) at cell L24), the potential value from the new employee is wasted and you’ve reduced the organisation’s profitability by more than $100k. A Financial VDT can be used to assess the financial performance of an organisation. For this example, we are measuring the Economic Value Added or EVA of an organisation. EVA is measure of whether a company is earning better than its cost of capital. These financial inputs can be changed to see how the impact on the EVA of the organisation. Here I have also plugged in some standard accounting ratios to show how you can track the financial performance at the same time. The elements of a VDT can contain whatever information you wish them to. For a reporting VDT we can allocate people to be responsible for specific value drivers as well as show how their achievement is dependent on one another. Here we have cascaded KPIs through the organisational hierarchy to specific individuals. We can report on the status on how they are impacting the creation of value. 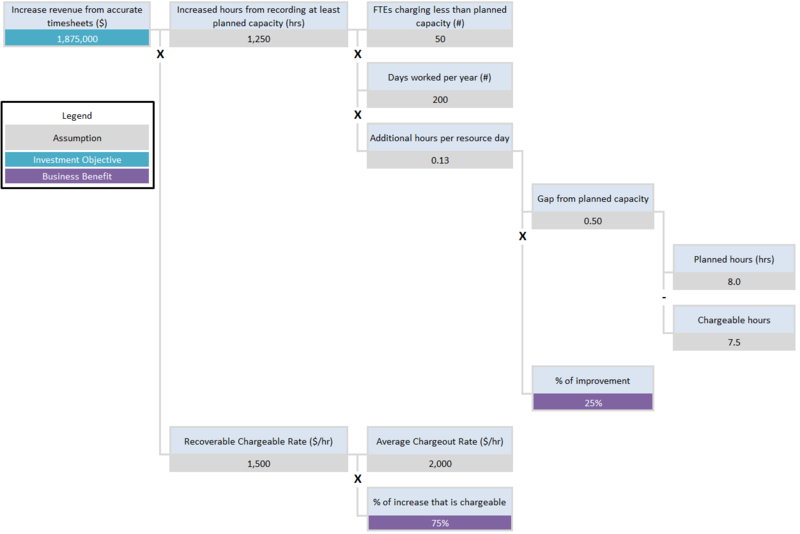 For example, in the diagram below, you can see that Susan Grace is doing well by keeping the average cost per employee down, but Luke King is affecting value overall because the average shift is greater than 8 hours. Without this level of detail, you might have only known that Margaret Gold’s KPI was on track and not seen the underlying issue of an overworked workforce. A table VDT contains the same mathematical logic as a VDT however, since it is in a table form, we are able to easily show information over time. In this instance we are using it to measure changes in planned performance. 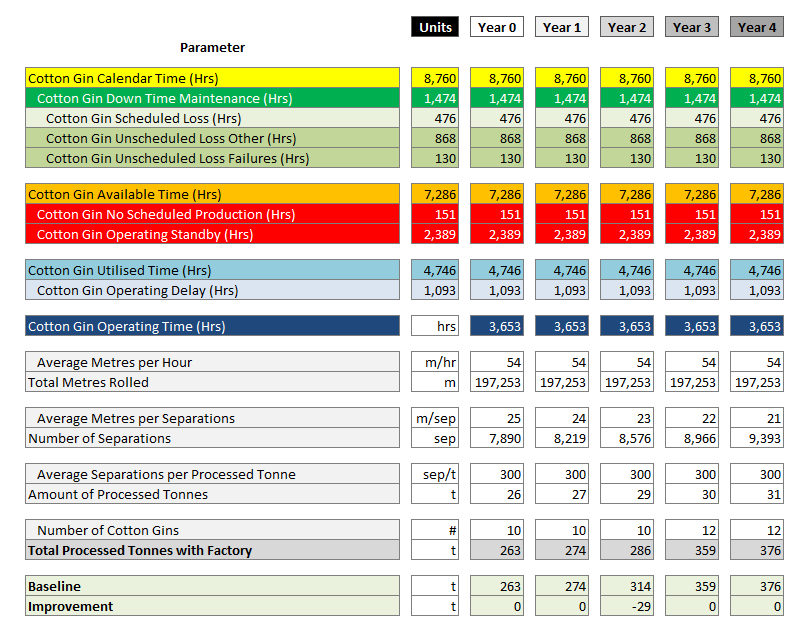 By incorporating time you can analyse seasonable trends or forecast future production. If this table was to be represented as a diagram, it would look like the VDT below. The table VDT above, can then be visualised as a diagram as below. In the next post, I’ll go through some of the fundamental principles you should follow for great VDM design.